Discussion in 'Effects, Pedals, Strings & Things' started by skunizzi, Dec 8, 2016. I love finding inexpensive pedals that sound great. I'd love to hear what your favourites are. Whats your favourite inexpensive pedal... Under $100? I'm currently loving my home made BSIAB 2 kit I built. Sounds great! DryBones, pomfret, WillLane and 4 others like this. reprove, joevacc, Flatscan and 5 others like this. I bought a homemade treble booster off Reverb for $50; it has an AC128 germanium transistor with a filter knob to tame some of the high end and bring back some low/low-mids. A little monster for sure. TC Mini Spark was $50 new off Amazon. For that price, it is a killer clean boost. Love it in front of a dirt box. Tom Von Kramm and Wolfboy1 like this. The above are all new and currently available/in production. Are you also asking about used pedals? That opens up another world of sub $100 possibilities. I can do so much with just these 2 pedals. These are USED under $100 all day long. Onemileguy and LordByron like this. this pedal has been one of the best additions to my board. I have all my pedals on the top row running through it so I can easily turn on and off multiple pedals at once instead of tap dancing. would highly recommend something like this if you like going from clean with lots of effects to dirt with no effects very quickly. Joyo AC Tone. I was totally blown away by how good it sounded. Definitely a lot better than a couple of boutique pedals I tried that are supposed to do the same thing. mach1, LordByron, northstar6000 and 1 other person like this. 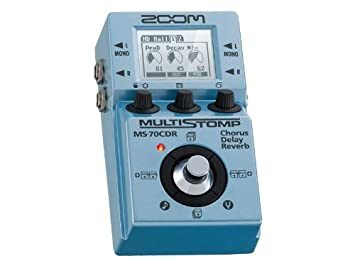 How does that Zoom Multistomp perform in a live setting? Does it sound good live? Easy to adjust settings? You can setup the footswitch to cycle through a pre-determined group of presets. I have it setup with about 5 presets, with 5 more completely bypassed presets in between. You can set it up so that a press/hold on the footswitch either enables the Tuner or Tap Tempo. It sounds great and I'm surprised they haven't expanded on the buzz around this pedal with more in the line or a larger format version with these same algorithms. Like anything programmable it has a learning curve. Once you figure out how they approach it, it's pretty simple to make quick adjustments. It's not as simple as a 3-knob overdrive, but it's relatively easy. cheapgtrs, LordByron and CEFlint like this. lately? I got a DOD 250 this week and I'm in love w/ it. LordByron, Tom Von Kramm and Abram4235 like this. LordByron and Tom Von Kramm like this. I really like my Mooer Black Shadow. I had an actual RAT but needed the extra space on my board (amazing how much an inch and a half makes) and I'm very satisfied with its tone.